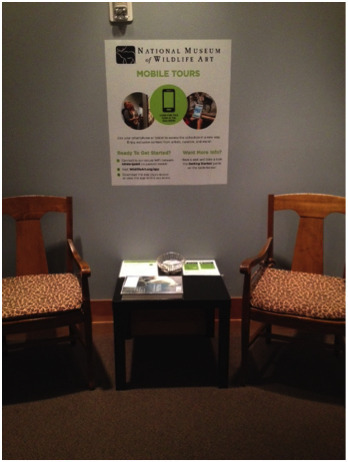 The National Museum of Wildlife Art set up a “download station” directly inside the main gallery doors. It’s the first thing that visitors see after they have paid admission and are ready to enter the galleries. No need to get too fancy, the download station consists of a few comfortable chairs and a small table to hold app information. There is also a poster designed to catch the eye of visitors and let them know that this free mobile app provides exclusive content from artists, curators, and more! The poster also provides basic info, like how to connect to the Museum’s WiFi, how to locate the appropriate app for your device, and the icon sticker to look for on the wall next to art objects that have audio content in the app. The station features a “Getting Started Guide,” a laminated sheet that answers FAQs, provides step-by-step instructions for downloading the app, and helps visitors decide between using the downloadable iOS app and the web app. Not wanting to stop there, the Museum has also created small “business cards” with a condensed version of the Getting Started Guide for visitors to take with them, in case they have questions as they browse the museum! There is also a book about the museum’s permanent collection, and in the summer, a basket of free, individually wrapped earbuds. While no official evaluation has been done, museum staff report seeing lots of visitors with their phones out at the station! What has the reception from visitors been like? The first addition will be to expand the Getting Started Guide for Spanish. The Museum is also going to take the concept of audio marketing to a whole new level by playing a soundscape of animal vocalizations via spotlight speaker directly above the download table! This has two advantages: drawing visitors to the table as well as advertising the Museum’s new audio tour featuring animal sounds. Finally, they plan to do an evaluation of the effect the download station is having on visitor engagement and identify any future additions or changes that could increase its usefulness to visitors. What can your museum take away? You can create your own download station, or you can pick and choose the parts that would work best for you! Do you have a new marketing idea that you’d like to share with us? Interested in learning more about how digital tools can impact visitor engagement at your museum? Chat with a Cuseum expert today!